Maths-Whizz exists to make teachers’ lives easier. Over the past year, we have visited schools the world over to understand how to help you achieve your curriculum goals. You kindly shared your feedback and insights from the classroom. We listened. The result is Topic Focus: the most powerful expression yet of our commitment to helping teachers raise standards in mathematics. Why all the hype? Because Maths-Whizz is now equipped to support your curriculum planning and delivery from end to end. 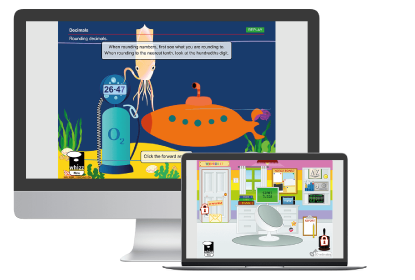 With Topic Focus, you can direct the virtual Maths-Whizz Tutor to any curriculum topic of your choice, gather actionable insights from streamlined class reports, and deepen your students’ learning with Extension Problems. All this means that you can achieve your curriculum goals in the most effective way possible: by delivering the right lesson at the right time for every child. Topic Focus is available to all users on the new Teacher Experience. Read on to learn how your class can benefit from this exciting release today! We know that teaching to a curriculum is tough work: hundreds of learning objectives, thirty students and a vast range of learning needs. What is a teacher to do? Maths-Whizz was created to empower teachers to deliver the curriculum according to each child’s needs. Our experience shows that Maths-Whizz is most powerful in the hands of our teachers. Maths-Whizz is more than a tutor; it is your dedicated teaching assistant; providing actionable insights to support your lesson planning. We know that the deepest learning experiences take place in the classroom, which is why we developed Teachers’ Resource to enrich your classroom experience. Topic Focus enhances the Maths-Whizz suite across all of these areas. You can now focus the Tutor’s attention towards any curriculum topic of your choice. Set topics through the Topics tab of your class reports using a simple wizard that lets you select your topic and deadline. Topic Focus is limited to 3 Progressions at a time, which corresponds to about a week’s worth of learning. It is ideal for week-to-week lesson planning. When students next visit the Tutor, they’ll receive lessons that best support their needs in that topic. Students who have not yet picked up the topic will continue to cover foundational areas to fill their knowledge gaps. Those who have picked up the topic will receive the lesson best suited to their needs, and those who have completed the topic can consolidate their knowledge in Topic Bank. You can deliver your curriculum with the confidence that every child receives targeted support tailored to their individual needs. Topic Focus is a huge step towards action-based reporting. You’ll notice that the Class reports have been streamlined to integrate the core actions with relevant insights. You can keep track of students’ weekly progress in the Comparisons tab, which tracks their current level (Maths Age), as well as their effort (Usage) and progress (Progressions). The reports are more focused than ever before on your week-to-week curriculum planning. To deepen your students’ learning, we have added a collection of Extension Problems to Teachers’ Resource. These problems are accessible to most students, but have several layers of depth for those that are ready to be pushed further. The Extension Problems can be used flexibly, and support both whole-class instruction and small-group learning. They are the perfect companion to the Tutor, which grounds students in the core knowledge they need to access higher-level problem solving. It is an exciting time to be a Whizzer. We look forward to building on the foundations of Topic Focus, guided by your feedback and insights from the classroom! To see how Maths-Whizz supports your curriculum planning, simply log in to your experience. Need more support? Drop a line to your dedicated Customer Success Manager. Do you want to be involved in user research to help us keep improving Maths-Whizz? Then get in touch with the Whizz Product Team at [email protected] – we’d love to hear from you!